As bishop of this diocese I am especially pleased to welcome fourteen new priests to the Roman “presbyerium”. Together with the Cardinal Vicar, the Auxiliary Bishops and all priests I thank the Lord for the gift of these new pastors of God's people I would like to extend a special greeting to you, dear ordinands: Today you are the focal point of the People of God, a people symbolized by those who fill this Vatican Basilica: they fill it with prayer and song, deep affection and profound, genuine emotion, of human and spiritual joy. Among this people of God, your parents and family, friends and companions, superiors and seminary educators, the various parish communities and the different realities of the Church from which you come and who have accompanied you on your journey and those in which you yourselves have already served pastorally have a special place. Not to mention the unique proximity, in this moment, of many people, humble and simple but great before God, such as, for example, the cloistered, children, the sick and infirm. They accompany you with the precious gift of their prayers, their innocence and their suffering. It is, therefore, the entire Church of Rome, that today gives thanks to God and prays for you, that puts so much faith and hope in your future, waiting for the abundant fruits of holiness and goodness from your priestly ministry. Yes, the Church is counting on you; it counts a lot on you! The Church needs each of you, in the knowledge that it is the gift that God offers you, together with the absolute necessity of every human heart to meet with Christ, the One and only universal Saviour of the world, to receive from him new and eternal life, true freedom and full joy. Thus we are all invited to enter into the "mystery" of the event of grace that is taking place in your hearts with Priestly Ordination, enlightened by the Word of God. The Gospel that we just heard shows us a significant moment in the journey of Jesus in which he asks his disciples what people think of him and how they judge him themselves. Peter replies on behalf of the Twelve with a confession of faith, which differs substantially from the view that people have of Jesus, for he says: You are the Christ of God (cf. 9.20). Where does this act of faith come from? If we go back to the beginning of the Gospel passage, we note that Peter’s confession is tied to a moment of prayer: " when Jesus was praying in solitude, and the disciples were with him,"(9:18). That is, the disciples are involved in Jesus’ unique being and talking with the Father. And so they are allowed to see the Master in the depths of his condition as Son, they are allowed to see what others can not, by 'being with Him, "by" being with Him in prayer, comes a knowledge that goes beyond the opinions of people to reach the profound identity of Jesus, to reach the truth. Here we are given an indication for the life and mission of the priest: in prayer he is called to rediscover the new face of the Lord and always the most authentic contents of his mission. Only those who have an intimate relationship with the Lord are grasped by him, may bring him to others, can be sent out. This is the "being with him" that must always accompany the exercise of priestly ministry; it must be the central part of it, above all in difficult times when it seems that the "things to be done" should take priority. I wish to highlight a second element in today's Gospel. Immediately after Peter's confession, Jesus proclaims his passion and resurrection, and he follows this announcement with a lesson on the path his disciples must take, which is to follow Him, the Crucified, follow the road of the Cross. And he adds - with a paradoxical expression - that being a disciple means "losing oneself", but only in order to fully rediscover oneself (cf. Lk 9.22 to 24). What does this mean for every Christian, but especially what does it mean for a priest? Discipleship, but we can safely say: the priesthood can never be a way to achieve security in life or to gain a position in society. The man who aspires to the priesthood to enhance his personal prestige and power has misunderstood the meaning at the root of this ministry. The man who wants above all to achieve a personal ambition, achieve personal success, will always be a slave to himself and public opinion. In order to be considered, he will have to flatter; to say what people want to hear, he will have to adjust to changing fashions and opinions and thus deprive himself of the vital relationship with the truth, reducing himself to condemning tomorrow what he would praise today. A man who plans his life like this, a priest who sees his ministry in these terms, does not truly love God and others, only himself and, paradoxically, ends up losing himself. The priesthood - let us always remember - rests on the courage to say yes to another will, in the awareness, to be nurtured everyday, that our compliance with the will of God, our "immersion" in this will, does not cancel our originality, rather on the contrary, it helps us enter deeper into the truth of our being and our ministry. Dear ordinands, I would like propose a third thought for your consideration, closely related to the one just mentioned: the call of Jesus to "lose oneself" to take the cross, recalls the mystery we celebrate: the Eucharist. With the sacrament of Holy Orders you today are gifted to preside at the Eucharist! You are entrusted the redemptive sacrifice of Christ, you are entrusted his body given his blood shed. Of course, Jesus offers his sacrifice, his gift of love full and humble, to the Church his Bride, on the Cross. It was on that wood, that the Father dropped a grain of wheat on the field of the world so that in dying it would become mature fruit, the giver of life. But in God's plan, this gift of Christ is made present in the Eucharist through the sacred potestas that the Sacrament of Holy Orders bestows on you Priests. When we celebrate Holy Mass we hold in our hands the bread of Heaven, the bread of God which is Christ, the grain broken to multiply and become the true food of life for the world. It is something that can not fail to fill you with intimate wonder, vibrant joy and immense gratitude: now the love and gift of Christ crucified and glorious, pass through your hands, your voice, your heart! We pray to the Lord to give you an ever vigilant and enthusiastic consciousness of this gift, which is at the centre of your being priests! So that he may give you the grace to be able to experience in depth all the beauty and strength of this and at the same time your priestly service, the grace to live this ministry with consistency and generosity every day. The grace of the priesthood, that soon you will be given, will connect you intimately, even structurally, to the Eucharist. For this, it will deeply connect in your heart the feelings of Jesus who loves to the end, until the total gift of self, his being multiplied bread for the holy feast of unity and communion. This is the Pentecostal outpouring of the Spirit, designed to ignite your soul with the love of the Lord Jesus. It is an outpouring that, while telling of the absolute gratuity of the gift, carves into your being an indelible Law – a New Law, the Law that urges you to make the same love of the Crucified Christ’s gift a part of the tissue of the specific attitudes and gestures of your daily life and to help it flourish. We again hear the voice of the Apostle Paul, even in this we recognize that powerful voice of the Holy Spirit, "you who were baptized into Christ have clothed yourselves with Christ" (Gal 3:27). Already with Baptism, and now in virtue of the sacrament of Holy Orders, you cloth yourselves with Christ. Care for the celebration of the Eucharist is always accompanied by a commitment to a Eucharistic life lived in obedience to one great law namely, that of love that gives itself entirely, and serves with humility, a life which the grace of the Holy Spirit helps to increasingly resemble that of Christ Jesus, the Eternal High Priest, Servant of God and men. Dear friends, the path that today's Gospel indicates to us is the path of your spirituality and your pastoral action, its efficiency and effectiveness, even in the most strenuous and arid situations. Moreover, this is the sure way to find true joy. May Mary, the handmaid of the Lord, who conformed her will to the will of God, who generated Christ gifting him to the world, who followed her Son to the foot of the cross in the supreme act of love, accompany you in your everyday life and of your ministry. 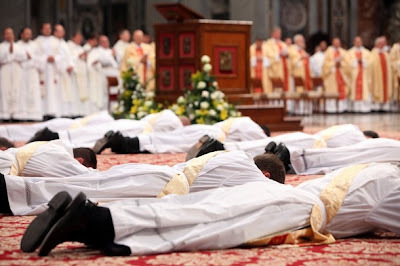 Thanks to the this Mother's tender and strong affection, you can joyfully be faithful to the conferral that today is given you as priests: to abide in Christ, Priest, who knew to obey the will of the Father and love man to the end.